'Bhutta' in rain is a delicacy. Hot grilled bhutta (Indian term for corn cobs) rubbed with fresh lime and potent mixture of spices is a Monsoon favorite in India. Yes! I bet you haven't enjoyed the monsoons in India if you haven't had freshly grilled smoky 'bhuttas' from the street side vendors while standing in the rains with a failed attempt of not getting wet. 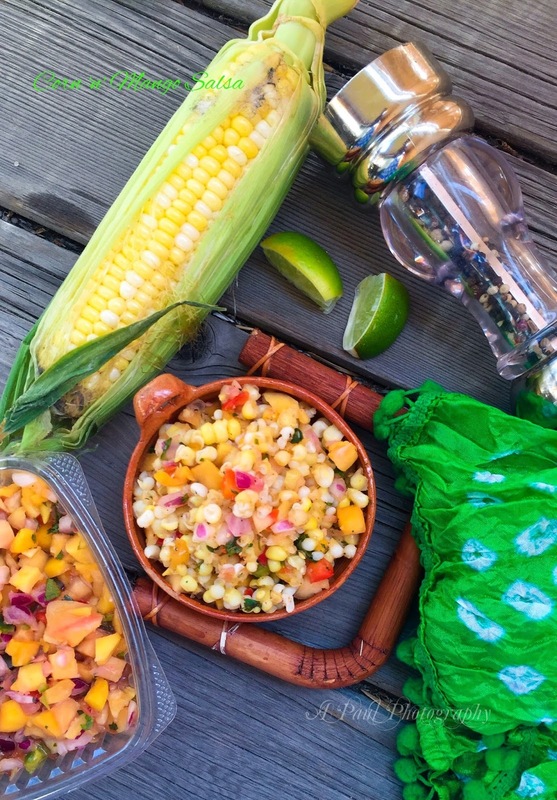 (Elotes are good, but 'bhuttas' are better.) Simple n lite with insanely delicious #todiefor flavors. Across the seven seas, here in America, we never miss the chance of barbecuing corn cobs over direct flame until charred and enjoying in the closed backyards with the fond memories of back home. 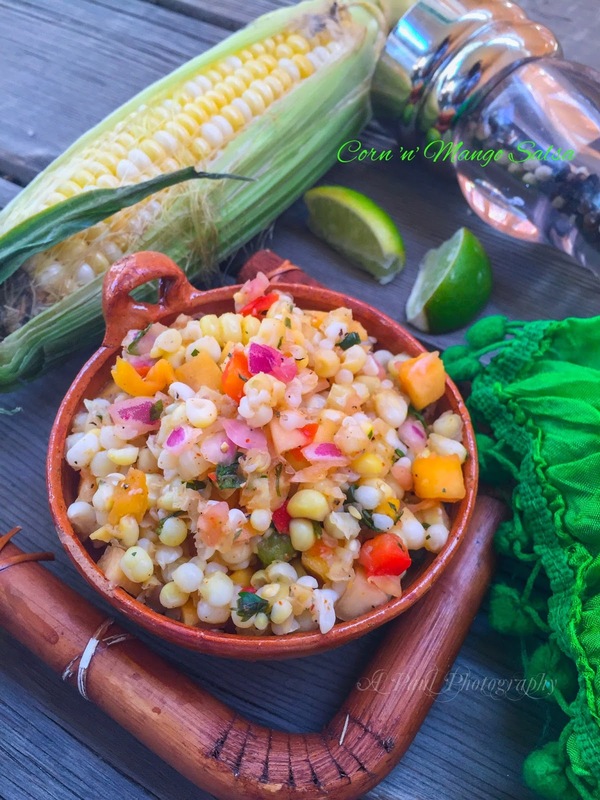 Many a times, making sweet corn salad or sweet corn salsa is also very tempting n satisfying. And today was that one day when I bought a dozen corn cobs from Whole Foods (yes, it was 3 for $1 !!!) 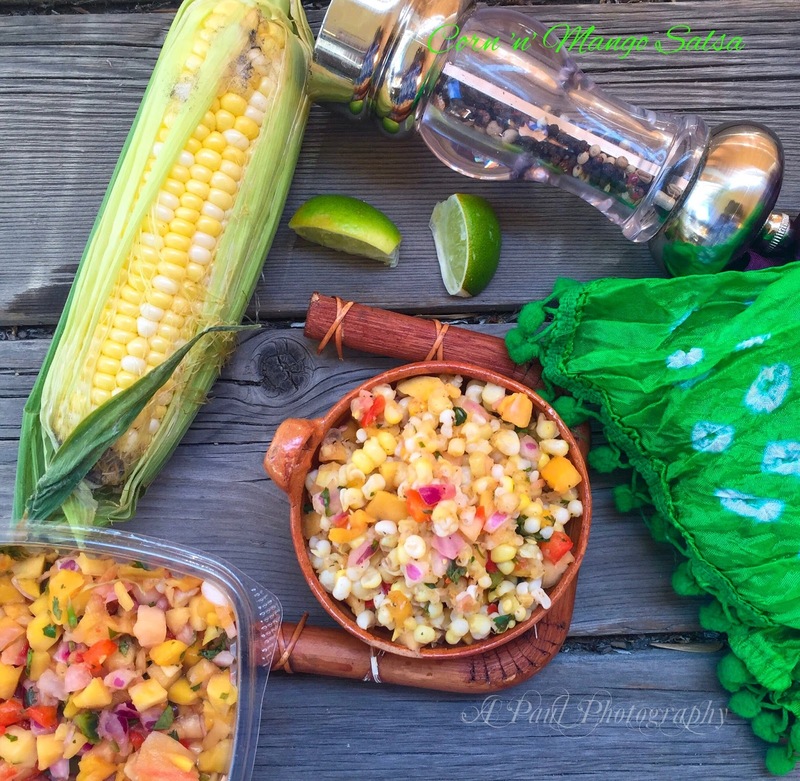 planning to prepare roasted 🌽, sweet 🌽 salsa and some 🌽 pudding. And yes, I succeeded in making atleast two of my planned items. 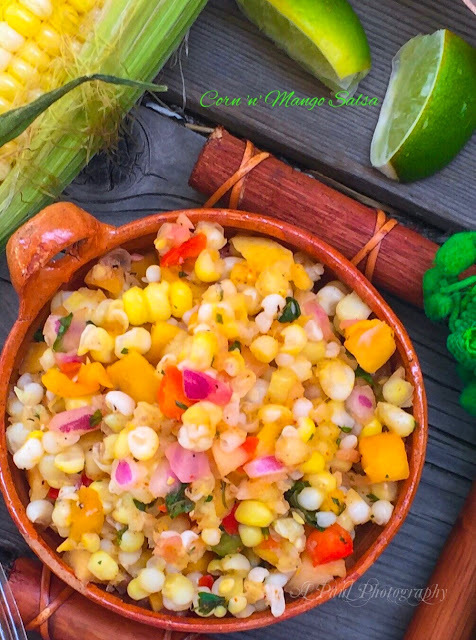 Sweet corn kernels when combined with chunky veggies and tangy fruits gives you some really fun textures in every bite. Great for your chicken salad or fish or you could be like me and eat it right out of the bowl with a spoon! Bring a large pot of salted water to a boil. Add the 🌽 cobs and cook until tender, 5-7 minutes; drain. Let cool before cutting the corn kernels off the cobs. In a large bowl, mix the corn kernals (if using frozen, add it here), mango salsa or diced mangoes, jalapeños, red peppers, cilantro and red onion in a bowl. Stir in half a teaspoon olive oil, the lime juice, sugar, kosher salt and a pinch of chaat masala.